United Launch Alliance helped the National Reconnaissance Office launch a classified national defense satellite aboard an ULA-built rocket on Friday. 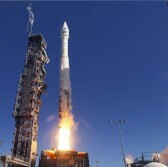 The company’s Atlas V Evolved Expendable Launch Vehicle 541 lifted off Friday at 7:19 p.m Pacific Time from Space Launch Complex-3 in California to deliver the NROL-35 payload into orbit, the company said Saturday. The U.S. Air Force introduced the EELV program to support government space missions. Jim Sponnick, ULA vice president for Atlas and Delta programs, said the company partnered with Aerojet Rocketdyne and the Air Force to build and test the rocket’s engine. ULA is scheduled to launch the Navy‘s MUOS-3 tactical communications satellite at Cape Canaveral Air Force Station in Florida on Jan. 20.